It appears that spring is about to begin and with it renewed activities in our Granges. What better way to start than with a visit from the National Master to Connecticut. Brother Ed Luttrell will have a meeting here on April 9th. He will be making a tour of our region then and will spend that Friday with us. Hemlock Grange, in Portland, has graciously allowed us the use of their hall that night. This meeting will be open to all Grangers who wish to attend. I realize that there are several Granges that meet on that night but I hope that they can work out some kind of arrangement that will allow their members to attend this important meeting. The exact time has not been set as of yet but I assume it will start sometime around 6:30 p.m. When I know the time I will Email as many as I can. I think it is important to hear what the National Master will speak on and since he finds it important to visit us I think we should do our best to have a great turn out. So pack as many people in your car as you can and come to Hemlock Grange that night. 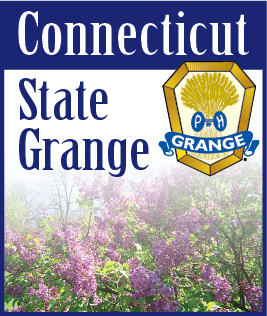 Is your Grange planning something special for Grange Month this April? How about an open meeting or other activity whereby you can invite members of your community to visit you and learn about the Grange. Talk this over with your members and see what is best for your Grange. It is spring and people are ready to get out and there are many activities to attract them to your Grange. Let's do it. You all know what the end of April brings and I don't mean showers. The last Saturday of April is clean-up day at Camp Berger. It is a ritual we go through every spring. The Director of our camp has some wonderful plans for this year and we expect an even greater attendance than we had last year. All we need to do now is make sure our camp is in tip top shape and safe for the campers. The more volunteers we get the easier the work will be so bring as many with you as you can. Winchester Grange has again graciously agreed to serve one of their special dinners for us later that afternoon at a minimal price of $5.00. After the dinner there will be a Pink Sash meeting and I would like as many of this group to come as possible. Any of our members who wish to attend either the dinner or meeting, are more than welcome to join us. You are specially invited to the camp clean-up. For new members who have never seen our camp this is your opportunity to get a close up view. Come in your work clothes and bring a rake or broom or whatever and enjoy yourself.